THIS 5 MINUTE HAND EXERCISE WILL BOOST YOUR ENERGY AND BALANCE EMOTIONS...!! Do you know about the Jin Shin Jyutsu? It is an ancient Japanese art and philosophy as well as powerful alternative health practice that can help you find and maintain balance in your physical and emotional well-being. It is a form of touch therapy that can relieve pain and harmonize the vital energy of the whole body. It involves gentle application of hands on the body in circulation pathways in a consistent, sequential pattern. According to Jin Shin Jyustu, each part of the hand is connected to different organs and its corresponding emotions. You can checkout the chart below and decide on which part of the hand to focus on. 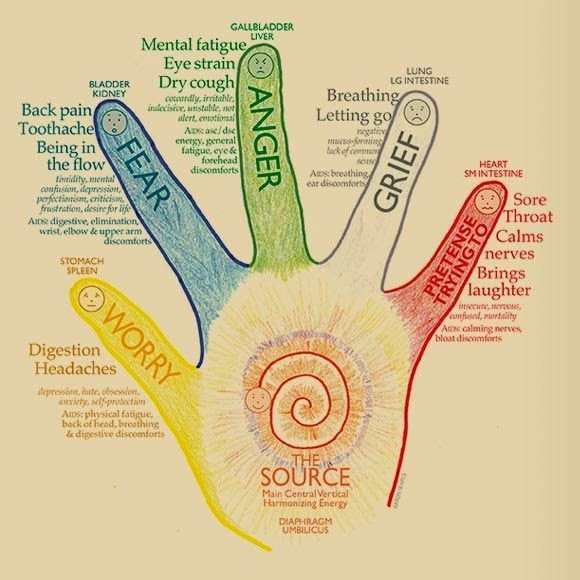 Hold the finger related to organ that you want to heal or emotion that you want to balance. Hold it for approximately 3-5 minutes while taking deep breaths. Repeat the above exercise on every finger if you want to balance and harmonize the full body. Physical Symptoms: skin conditions, digestion, respiratory problems. Physical Symptoms: blood pressure, sore throat, bloating.